Following yesterday’s Cambridge Trial Eights, Oxford’s men took their turn to race competitively matched crews on the championship course. With only two returners from last year’s winning Blue Boat, Oxford have had to blood new talent and integrate a strong new batch of athletes from the junior world. Felix Drinkall, winner of the Great Britain Senior Trials alongside Tobias Schroder, stroked ‘Strong’, whilst Vassilis Ragoussis was the opposite number in ‘Stable’. Having won the toss, Stable called Surrey and both crews lined up below Putney Bridge under the guidance of Umpire John Garrett. The start gave little indication of what was to come as both crews got away cleanly. Strong clearly had a looser style which paid dividends almost immediately, as they worked a couple of seats advantage within 30 strokes and had eased out to half a length by Craven Cottage. Steering was to become a dominant topic for this encounter, as Garrett was repeatedly called into action; his first engagement was separating the two crews as they clashed around the final phase of the opening bend. Strong fared slightly better as they capitalised on their bend advantage to move out to nearly a length. Stable recovered well to negate the bend and began to claw back the margin passing Harrods Depository. 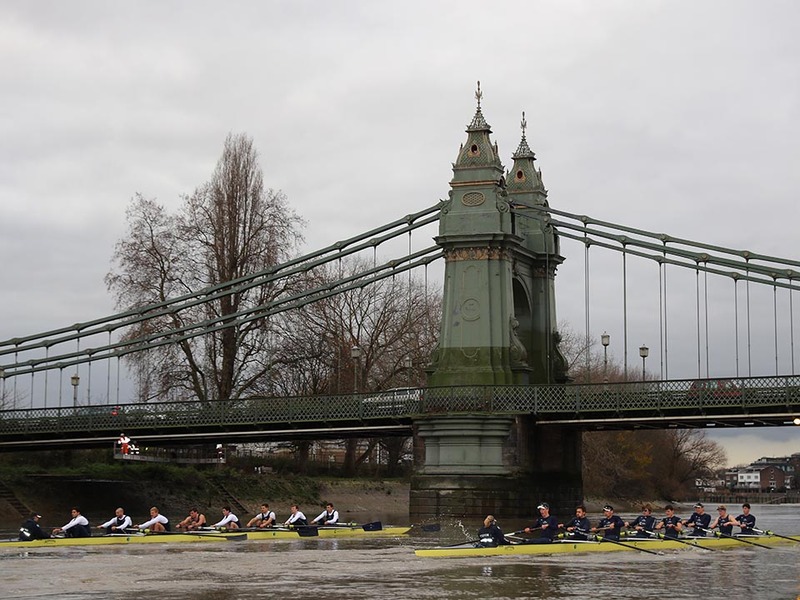 The distinctive green arches of Hammersmith Bridge appeared over the horizon as the crews drew level; aggressive steering from both coxes led to the boats meeting in mutual water once again. The dynamic of the race was clearly defined by its intensity and fluidity as Strong held the repeated advances of Stable along the outside of the Surrey corner. Although they were warned by Garrett, Strong took half a length passing Chiswick Eyot and were straining to break clear a further 500m down the course. The river conditions worsened as both crews struggled in the choppy water; another minor clash ensued, which led to Strong finally breaking clear passing the Bandstand. However, the race-ending blow was delivered just in front of Barnes Bridge; the call went up and Strong put in an impressive push which effectively ended any chance Stable had of recovering the deficit. The race continued as something of a procession, as Strong ran out two-length winners.